In life, there are times when we encounter a huge obstacle in our path. It looks like the end of the road, and we can’t seem to find the strength to move on. It is at precisely these times, when we can no longer think of a reason to continue, that we must think of a reason to start over. I came across this wonderful quote, which I want to share with all of you. It is a beautiful analogy which makes us look at endings in a new light. I have come to realize that there is a lot of power in these three words “From now on..”. These three words can release you from your past regrets, and guide you to your new life. Whenever I feel overwhelmed with worry about the what-ifs and the if-onlys of my past, or feel like I have reached a dead end in my path, these three words give me great comfort. I write it down on a piece of paper, and visualize my life “From now on..”. Sometimes it helps to know that most beginnings are disguised as painful endings, and we should just place our trust in the magic of new beginnings. I would love to hear from you. Was there ever a time in your life when you felt like you hit a roadblock, but you moved on in-spite of it, and found a path full of new opportunities? Shantala, I love that caterpillar quote! Thank you for continuing to post such inspirational messages! OH many many times have I come across this in life. Have risen well on some occasions, whimpered at others, failed miserably at other times. But learning experiences all the way. Good one, Shantala! Inspiring post, Shanaya! yes there have been such moments…and thankfully I held on..now when I look back, all that seems so inconsequential! Oh yes, many times actually. And each time I moved on the experience was different too. We live; we learn. Fabulous post Shantala! Just my kind – so positive and inspiring. That is such an inspiring story, Sundari. Glad that it all worked out for you. 🙂 More power to you! One of my favourite quotes, S! A very Inspiring Quote! And yes all of us come across a roadblock a lot of times in Life. And we have to remind ourselves that life doesn’t end here. We have to stand again on our feet. Very tough and gruelling. But makes you learn the biggest answers of life! Thanks for sharing! [email protected] recently posted…Beauty Regime of A Mother! Great inspirational post Shantala. I loved that caterpillar quote and it reminds me that the best is yet to come. Very well written. Some time or the other we all experience such situations. At such times your inspiring words will help. I have faced them many times. And over the years I have come to believe that these events are opportunities for spiritual growth. 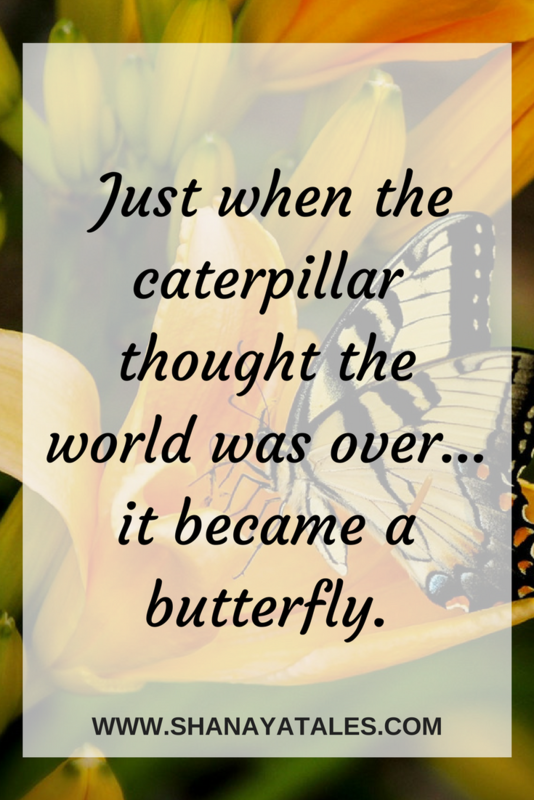 Love the butterfly quote and the From now on truly has power. Very nicely done. What a beautiful quote and so true! The thing is we often understand this only in retrospect. A great post. ‘From now on’ – it really holds a lot of promise, I feel. And, it also brings about a positivity in our attitude, and hope, for a better future. Shantala, I agree with you completely. I had written a post on the same lines some time last year, have a look if you can, it’s title is Fog of Fear. I like the sound of From Now On… lovely inspirational post. I will certainly check it out, Sulekha. I am enjoying your stories about Sparky 🙂 Thank you for stopping by. Such a wonderful, motivating post, Shantala! I loved the quote and also your mantra of the three magical words. Indeed, it is put to us to look for the good even in our failures and believe that if it has not been good so far, it can only get better from now on. Thank you for the lovely post and all the best for the remaining challenge! That’s a wonderful post Shantala. The quote could not be more true. Whatever happens moveon with life… this is my mantra when time is rough. And l love that caterpillar quote. Yes, many times. I just recently started all over again after self-publishing my book and realizing I have no one to help me market it… and thus no readers! but as you say, trust. trust in your abilities and the Divine is what makes you embark on that new beginning yet again. Cheers! Hi Shantala, my life has been full of new beginnings, but often in unconventional ways. I spent a long time feeling in a place of ‘no-thingness’ where my life felt like nothing was moving, but everything was moving underneath the realms of my conscious awareness. I sometimes feel that we go through periods of gestation where we need the apparent lack of movement or ‘stuckness’ to give us the energy and readiness for that new beginning, My new beginning started in October last year and my blossoming has begun. Prior to that I was in a void of dark, but not in a bad way, in a very good way, gestating the new. Much like the caterpillar. I relate to this quote more than anyone here coz I’ve overcome a lot of roadblocks. Every time I think it is the end of life something magical happens and pushes me forward to something absolutely unexpected and exciting! Short, sweet and beautifully written post Shantala. Beautifully written and very motivating. I must try to remember the quote for all the times when being positive takes superhuman effort…. I love that quote. Having children makes it impossible to give up. You have to keep going no matter what happens to set you back or drag you down. That was interesting and thoughtful, thanks for sharing! Love the quote. Yes, I’ve been through a few roadblocks in my life, but managed to start fresh and move on to something new. I post a bit of personal essays on my blog, so a few of those will be mentioned there. I am currently 520 on the A to Z Challenge List. Visiting your blog from the A to Z Challenge and glad I did. I guess the obstacles of life are what that makes life interesting . They also make us grateful for all the times things work out 🙂 Thanks for stopping by, Salvwi. Glad to have connected with you. A great quote to live by. Life always has a plan B.